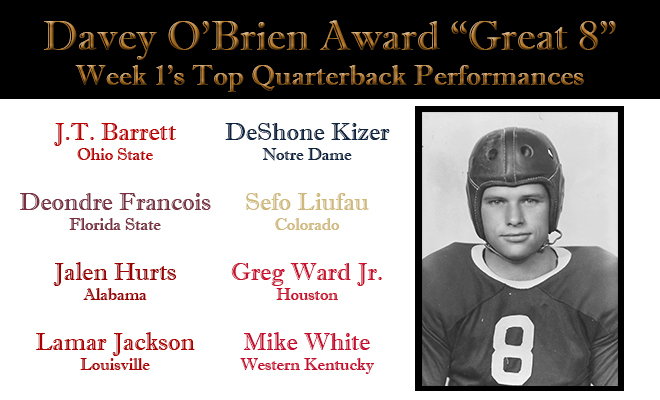 FORT WORTH, Texas (Sept. 7, 2016) – Three quarterbacks making debuts at their respective schools are among the eight players named to the Davey O’Brien Award’s “Great 8” for the first week of the 2016 college football season. 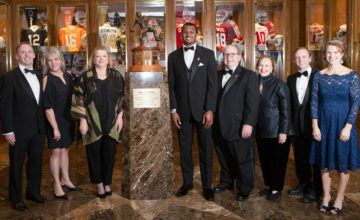 The eight honorees, as determined by voting from the award’s selection subcommittee, include: J.T. Barrett of Ohio State, Florida State’s Deondre Francois, Jalen Hurts of Alabama, Louisville’s Lamar Jackson, DeShone Kizer of Notre Dame, Colorado’s Sefo Liufau, Greg Ward Jr. of Houston and Western Kentucky’s Mike White. Two of this week’s “Great 8” performers, Francois and Hurts, were freshmen making their collegiate debuts, while White, a junior transfer, was competing for the Hilltoppers for the first time. 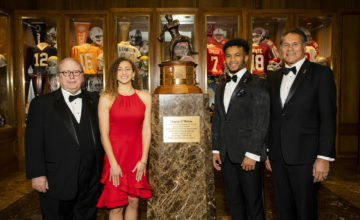 In addition, two players, Barrett (2014) and Ward (2015) are previous semifinalists for the Davey O’Brien National Quarterback Award. All 128 FBS quarterbacks are eligible for the weekly honor. 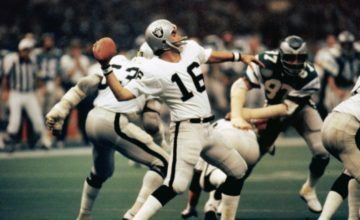 The winner of the Davey O’Brien Quarterback of the Week Award, which will be one of the week’s “Great 8” quarterbacks, will be announced Thursday. Broke the all-time school record for single-game touchdowns with seven (6 pass, 1 rush) against Bowling Green, while totaling 379 yards (349 passing). Deondre Francois, Florida State, Fr., 6-2, 205, Orlando, Fla.
Was 33-of-52 passing for 419 yards and two touchdowns, and added 59 rushing yards to lead Florida State to a 22-point comeback win over No. 11 Ole Miss. True freshman contributed four touchdowns in a 52-6 victory over No. 20 USC, with nine carries for 32 yards (2 TDs) and 118 passing yards (2 TDs). In just one half, posted a school-record eight touchdowns with 286 passing yards (school-record-tying 6 TD passes) and added 119 yards rushing (2 scores). Connected on 15 of 24 passes for 215 yards and five touchdowns and also rushed for 77 yards and a touchdown in a 50-47 double-overtime loss to Texas. Sefo Liufau, Colorado, Sr., 6-4, 230, Tacoma, Wash. Went 23-of-33 for 318 yards (1 TD) and ran for 66 yards in a 44-7 win over Colorado State; became school’s all-time leader in career passing yards (7,715). Led Houston to a 33-23 upset win over No. 3 Oklahoma by completing 23 of 40 pass attempts for 321 yards and a pair of touchdowns against no interceptions. Mike White, Western Kentucky, Jr., 6-4, 215, Fort Lauderdale, Fla. Threw for 517 yards and three touchdowns while having just six incompletions (25-for-31) in his Western Kentucky debut, a 46-14 victory over Rice.